Lift the handbrake lever up fully. 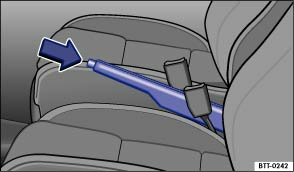 The handbrake is applied when indicator lamp lights up in the instrument cluster . Lift the handbrake lever up slightly and press the lock button (arrow). Guide the handbrake lever down whilst the lock button is pressed. The incorrect use of the handbrake can cause accidents and serious injuries. The handbrake should never be used to brake the vehicle, except in emergencies. The braking distance is considerably longer as only the rear wheels are braked. Always use the foot brake. Never drive the vehicle with the handbrake on slightly. This could cause the brakes to overheat and cause problems with the brake system. This also causes premature wear on the rear brake pads. Never activate the accelerator from the engine compartment if a gear has been selected and the engine is running. The vehicle could move, even if the handbrake is applied. If the handbrake is not applied fully when the vehicle is stationary and the brake pedal is released when then selector lever is in position P, the vehicle may move a few centimetres forwards or backwards. An audible signal is given if the car is driven faster than approximately 6 km/h (4 mph) with the handbrake applied.